A new photo of the rumored Samsung Galaxy Premier appeared online Wednesday, thanks to serial tipsters @evleaks. 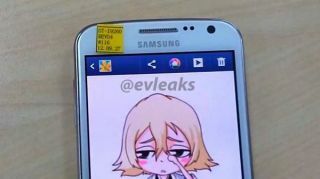 The photo was tweeted from the @evleaks account with the message, "Samsung GT-I9260 (Galaxy Premier?) in the wild." If the device pictured really is the Galaxy Premier, then it does indeed bear a striking resemblance to the popular Galaxy S3, matching previous rumors. Overall, the Galaxy Premier is believed to lie somewhere between the Galaxy Nexus and the Galaxy S3, a notion that's supported by all the details that have leaked so far. Previous and current reports agree that the Samsung Galaxy Premier will fall somewhere between the Galaxy Nexus and Galaxy S3 in pricing and power. The original Galaxy Premier report, which stemmed from a German website shortly after the official announcement of the Galaxy S3 Mini, claimed the Premier would sport a 1.5GHz dual core processor, a 4.6-inch 180x720 Super AMOLED display, an 8-megapixel camera, Bluetooth 4.0, NFC and DLNA. That report also said the Premier would run Android 4.1: Jelly Bean out of the box. Later rumors mentioned a 2-megapixel front camera and changed the display size to a possible 4.65 inches, while Wednesday's report adds 1GB of RAM, a microSD slot for up to 32GB of extra storage, an LED flash and Samsung's TouchWiz UI. This isn't the first time the Twitter account @evleaks has outed pictures of an unreleased and unannounced device. Most recently, the serial tipsters behind the account tweeted photos of the under-wraps LG Nexus 4 - on two separate occasions. Photos of the Nokia Lumia 920 and Lumia 820 were also leaked by the account, as well as some images of the HTC One X+. Unfortunately, those leaks don't come with many specifics, such as when the Galaxy Premier might actually be announced by Google or Samsung. Stay tuned for that.